Big Bacon Challenge: after the challenge – what now? You’ve come to the end of the bacon challenge, hopefully sampled your efforts and agreed they are *good*, so where do you go from here? I was very pleased (a teeny bit smug, even?) to hear that one of my volunteers has already dived in and ordered her own supply of Supracure – if you want to do the same, I can heartily recommend both HotSmoked and Weschenfelder (details in my Suppliers List) for curing and smoking supplies. Both sell Supracure in 2kg packs for about six or seven pounds. Before considering whether to do the same, and make curing a regular part of your culinary routine, it’s worth giving the costings a little thought. 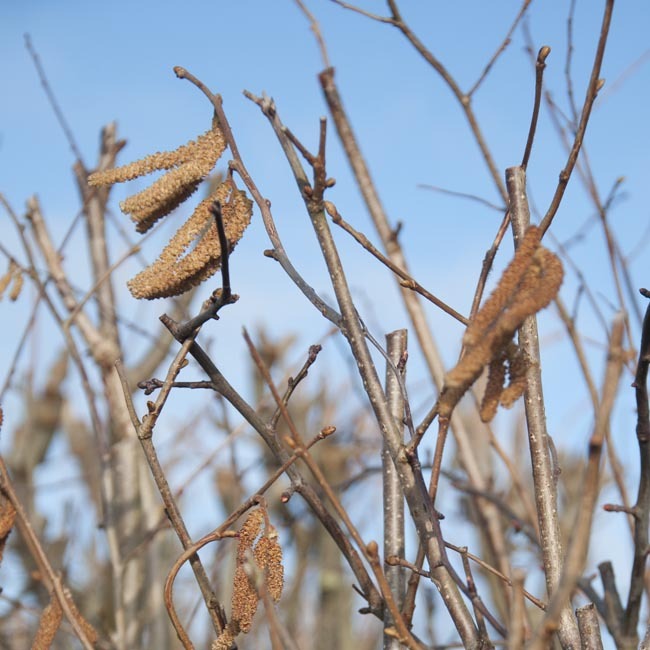 By necessity this is just a snapshot – since food prices are constantly shifting – but it gives an indication. Let’s look at 1kg of back bacon. On the basic recipe this will take 1kg of pork loin, 80g of curing salt and 20 g of sugar. We’ll ignore the sugar for convenience, since it’s a small quantity and you almost certainly have it already. 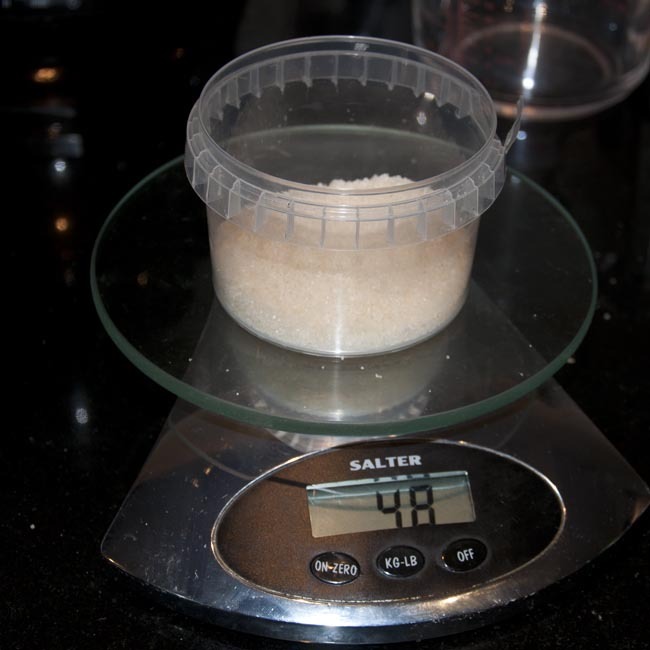 The curing salt costs – round figures – about 30p. So really it’s just the meat we need to consider. 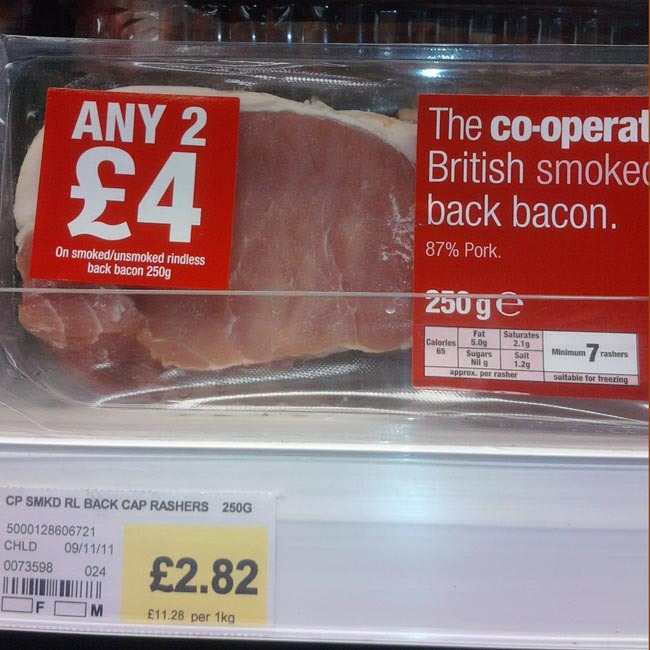 You can generally get hold of bog-standard own-brand back bacon on ‘2 packs for £4’ type offers where the pack size is between 230g and 250g. Bearing in mind this bacon is about 13% added water, let’s call that an equivalent per kilo cost of about £9. Compare with this, Tesco this week list their Rind-on Pork Loin Roasting Joint at 3.99/kg – admittedly a half-price special offer, but even the full cost of £7.99/kg represents a *small* saving. The key to really making this work is to buy whatever’s cheap this week – be it loin or belly, or even belly slices. It’s a pretty safe bet most supermarkets will be discounting something suitable at any given time. Of course it pays to be flexible, but if you only like back bacon, buy loin when it’s cheap and freeze it – or make a big batch all at once and then freeze it once it’s bacon – personally I can see no difference in quality from doing this, though obviously you should do one or the other, not both! 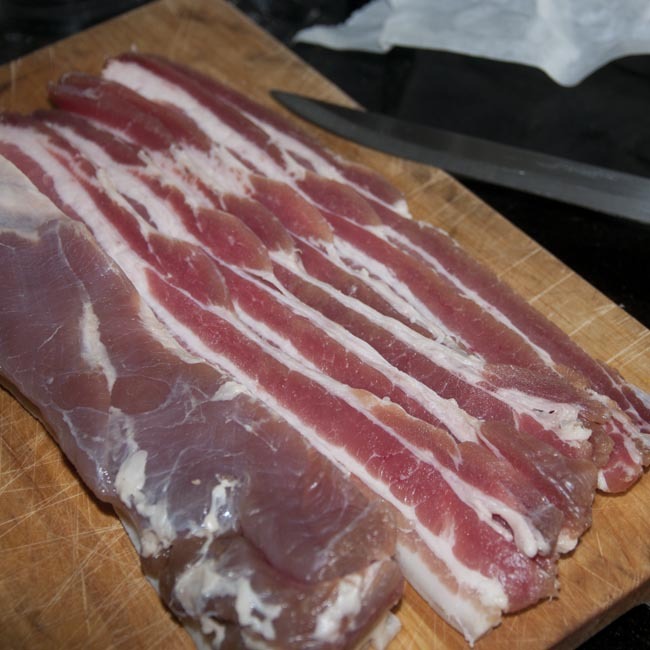 To even start to compare like with like, though, it’s really good dry cured butcher’s bacon you need to consider – a spot of quick googling suggests this is for sale from various producers at about £15/kg. So it’s clear that with a bit of canniness, not only is the end product fantastic, but there’s an easy 50% saving to be made on the cheap & nasty brine-injected supermarket commercial bacon offering, and a tidy 75% off the nearest equivalent butcher’s bacon. 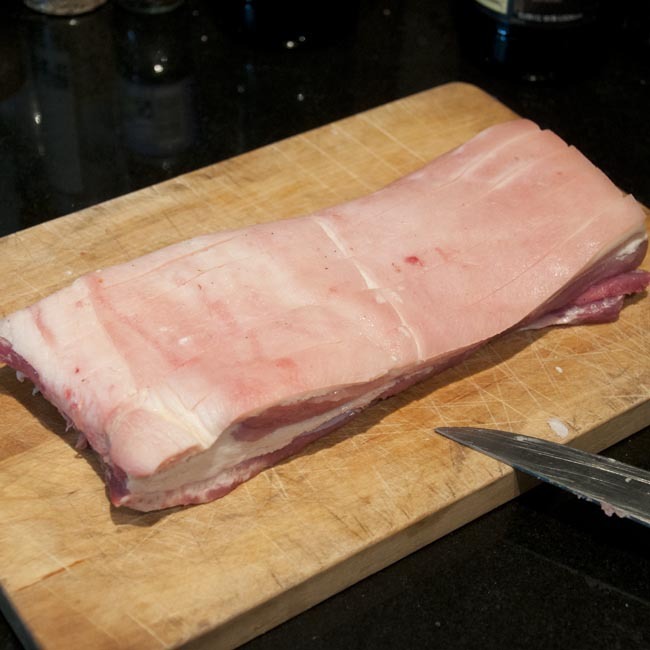 Streaky bacon is usually a little cheaper than back, but since belly pork is a cheap cut par excellence, the maths for home-cured streaky bacon generally adds up just fine without depending on special offers. Convinced? Then you’ll need to decide what to try next. 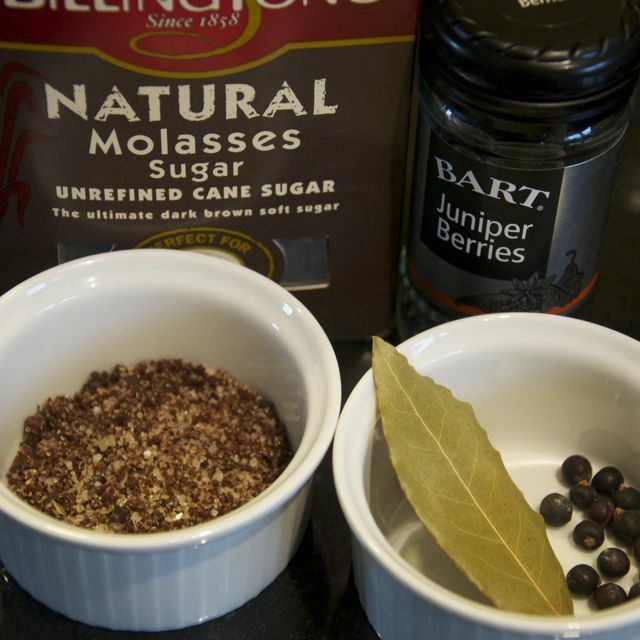 My usual ‘house’ cure is actually a black pepper cure – essentially the cure we used for the Big Bacon Challenge, but with 3 grams of freshly ground black pepper (I recommend a pestle and mortar for this) added per 50-60g of cure mix (curing 500 – 600g of bacon). 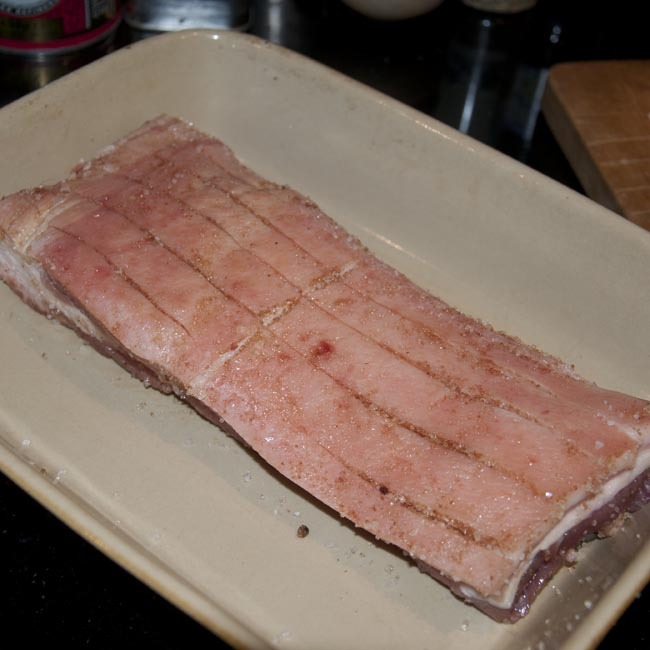 This cure is great with or without smoking the bacon after curing – more of which later. If your taste runs more to cooking bacon for stews and sauces than to breakfast rashers, perhaps try the bay and juniper cure, which produces a lovely deep rich aromatic flavour. The limit to what to add to cures really is your imagination – within some basic limits on proportion of salt and sugar (I’ve used between 20% and 33% sugar with great success) – do some reading (perhaps look in the Library for inspiration) and see what you fancy! 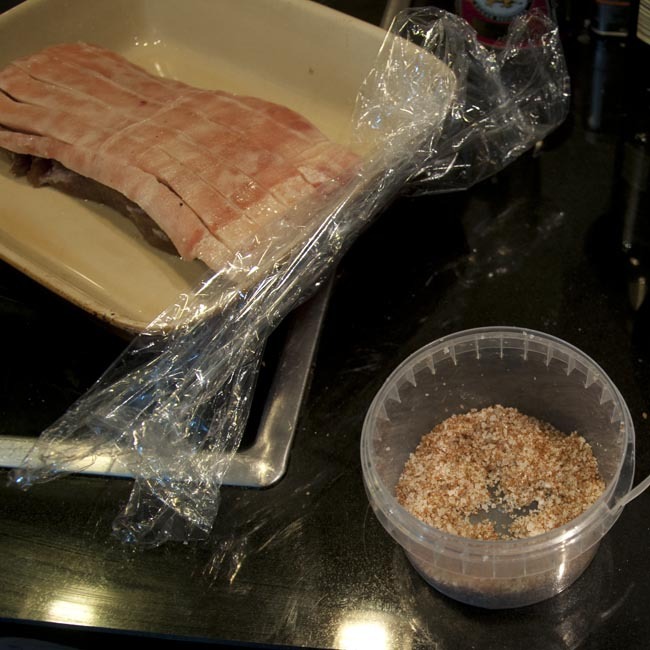 I can’t leave the subject of bacon curing without a brief mention of smoking. Not everyone likes smoked bacon, of course – though since commercial ‘smoked’ bacon has concentrated smoke-flavour added to the brine, and bears about as much resemblance to the real thing as Nescafé does to a real steaming espresso, perhaps it deserves a second chance..? I’m British, so when I think about smoking bacon we’re talking about cold smoking. The key to this process is bathing your cured meat in cold smoke over a period of several hours (I usually smoke my bacon for 10 – 12 hours), so you either have to produce your smoke consistently, and with as little heat as possible, within the smoking box, or produce hotter smoke at a distance from the box and then ‘duct’ it in allowing time for it to cool down. It’s a tinkerer’s paradise, so please do consider it for a bit of a mad project – there are as many designs for DIY smokers as there are people who build them I think! We designed and built a wooden tower smoker – effectively just a fancy wooden box with some shelves in it – which I fill with smoke using a commercially available cold smoke sawdust burner. I probably could have constructed a smoke generator very similar for not much money, but I wanted to start with something that would Just Work, the cost wasn’t prohibitive (around £20) and I don’t regret the decision. 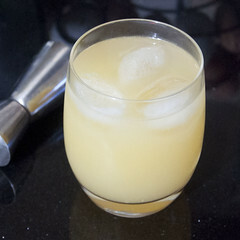 It’s a great piece of culinary gear, think how much fun – and flavour! – you could have with smoked trout and salmon, smoked salt, smoked garlic and chillies, as well as your bacon! Finally, a big thank-you to all my Big Bacon Challenge volunteers – looking forward very much to hearing what you all thought of your efforts – and to the rest of my readers, thank you for your patience with the bacon-centric tone of the blog the last couple of weeks, normal service will be resumed very soon! All the Big Bacon Challenge posts will be collected under the ‘BigBaconChallenge’ category heading – so go there to read them all! Big Bacon Challenge: time to share and enjoy! You’ve made your bacon, and now it’s time to sample it! You can do anything with your home-cured bacon you can do with shop-bought bacon, and more. Of course you can slice it and fry or grill it as part of a full english breakfast (or in a floury bap with ketchup, or in a sandwich with lettuce tomato and mayo). You can dice it and enjoy it in stews and pasta sauces (think lardons or pancetta). Really the only limit is your imagination. I recommend you sample your bacon for the first time cooked very plainly – sliced and fried or grilled – since you’ll get the best sense of what the flavour and texture is like this way. 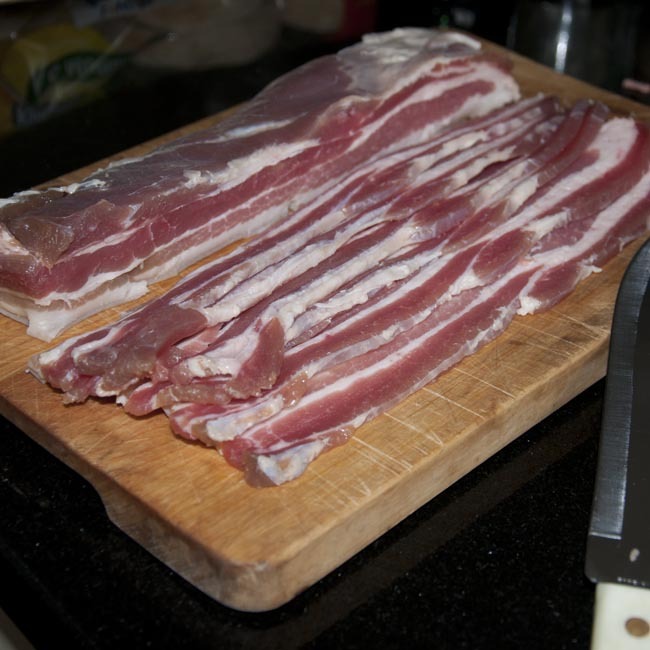 Get a nice sharp long-bladed knife – it’s worth taking the extra couple of minutes to sharpen this if the blade isn’t quite up to scratch – and slice the bacon as thinly as you can. 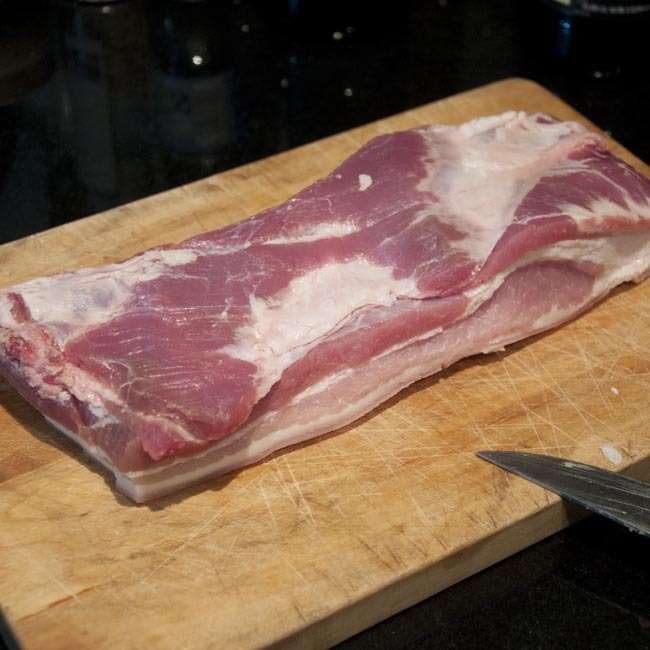 You’re not going to get it as thin as commercial bacon, but that’s fine – aim for about 2mm thickness, this should be very achievable with some practice. It’s worth cutting a thicker piece off first to get a nice flat edge – this won’t go to waste as you can dice it for a stew or a sauce later. Leave the rind on – you don’t have to eat it, you can always trim it off later. 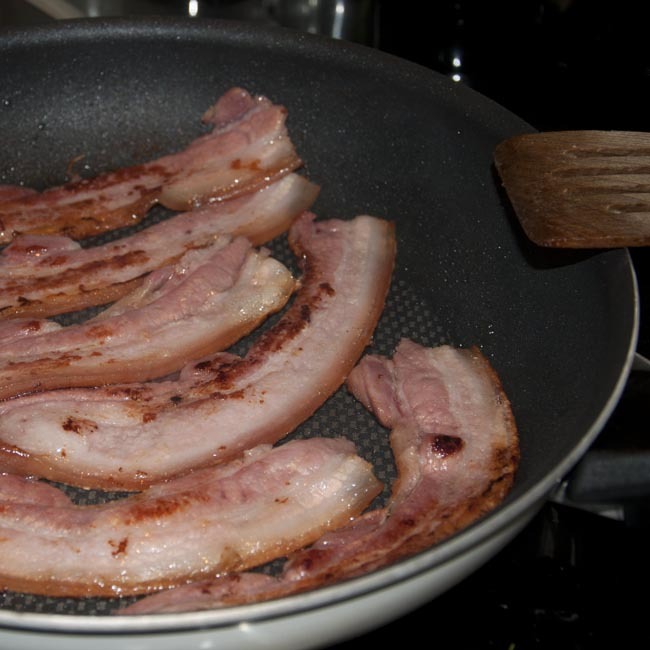 Put your sliced rashers into your frying pan on the hob, and wait for the sizzle. This really will be the first sign you get that things are cooking. What you won’t get is the pan full of white liquid we’re all so familiar with from commercial bacon, in fact it will stay completely dry until later in the cooking process when the fat starts to render. 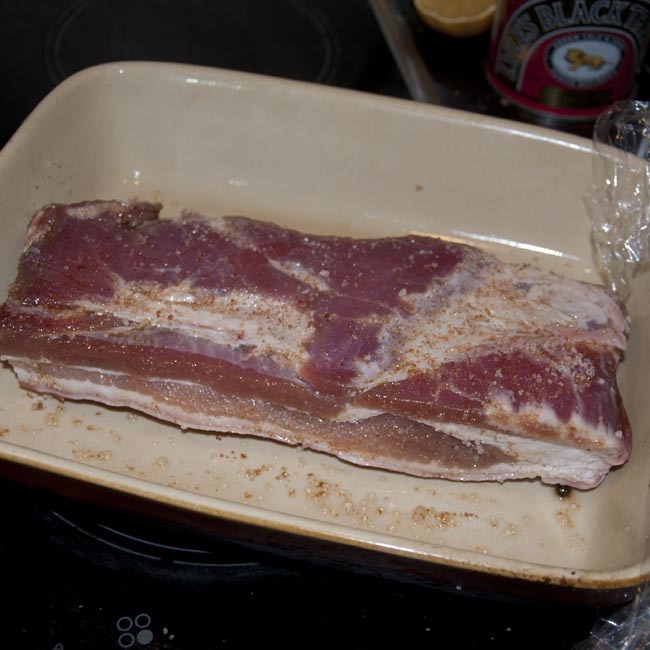 Cook your bacon, turning occasionally, until the fat is rendering and you have some lovely golden caramelised areas. This bacon will take longer to cook than stuff from a packet – it’s sliced thicker, and it’s a lot denser, so be patient and take the time. Then serve in whatever way you like – we had ours with a fried egg and toasted muffin for breakfast. The hens get a mention for the gorgeous fresh egg, too! If there’s any bacon left over, wrap it up in the paper again and put it back in the fridge. It will keep at least a week and usually two. Don’t be tempted to seal it in a plastic bag, cling film or in a tupperware box, it’s a natural product and needs to breathe! When you taste your bacon, please let me know what you think of it! In the last post of the bacon challenge series, I’ll suggest some ideas of places your new skill might take you next! Big Bacon Challenge: Day Five – that’s it, you’re done! 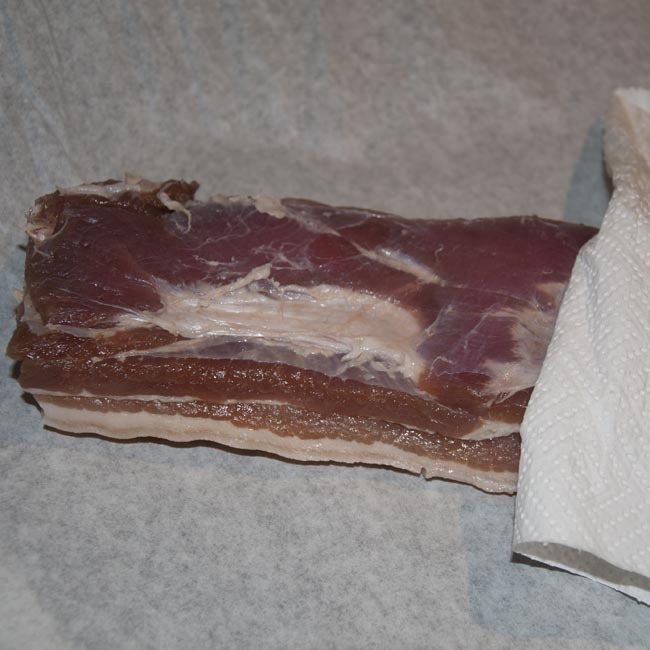 Take your bacon out of the fridge, rinse it well under cold running water, dry it thoroughly with paper kitchen towel, and wrap it loosely in baking paper / parchment. Ideally leave it in the fridge for at least 24 hours before you eat it – I know this sounds like the worst kind of torture, but there are a couple of good reasons to be patient. Firstly it allows a layer called the ‘pellicle’ to form on the surface of the bacon, you’ll see this appear, it’s a glossy, slightly tacky surface layer which is especially important if you’re planning to smoke your bacon as it helps the smoke flavours to be absorbed into the bacon. Resting the bacon also allows the cure to equilibrate evenly through the bacon, whereas you’re likely to find the outside saltier if you tuck in straight away. I can’t wait to hear what you all think about the results of your efforts! More on keeping, preparing and eating your bacon in the next post – along with some ideas on where to take your curing endeavours from here! Big Bacon Challenge: Day Four – nearly there! 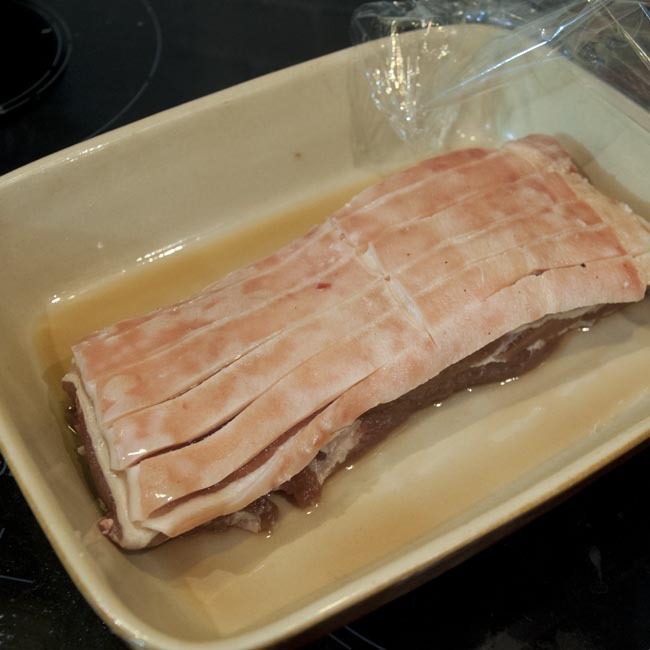 If you’re making streaky bacon from belly pork, this is the last time you need to drain the pickle from your bacon, and apply the rest of the cure – if you’re making back bacon from loin I’m afraid you have one more day of this to go. Still, all of you are now tantalisingly close to the marvellous ‘eating the bacon’ stage of the experiment. 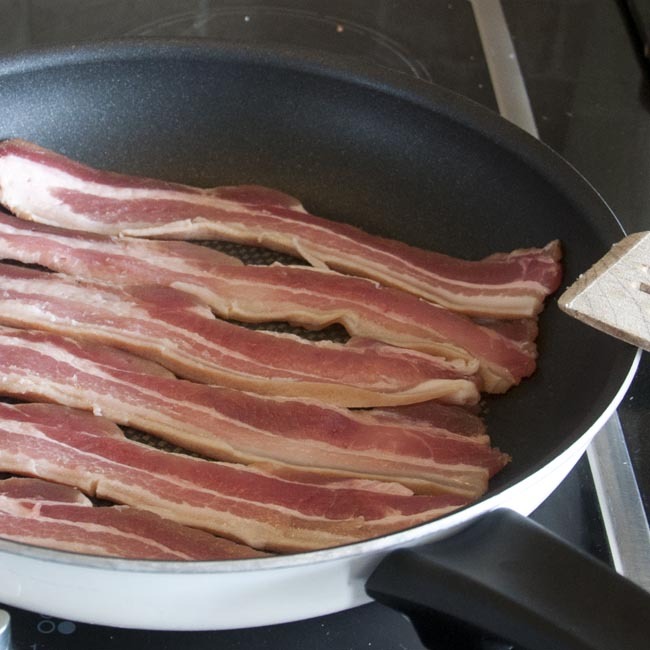 Your meat should be looking very much like bacon by now. Hungry yet? Big Bacon Challenge: Day Three – short and sweet! Don’t worry, I haven’t forgotten about the bacon challenge! Which is ironic, as on day three of my bacon process this time, I did in fact forget entirely and only remembered on the morning of day four. It’s not a disaster – if you do forget an application, just do it as soon as you remember and then carry on as you were before. Magic. Today, you’re just repeating what you did yesterday. You should have it down to a fine art by now, and it should take no time at all! 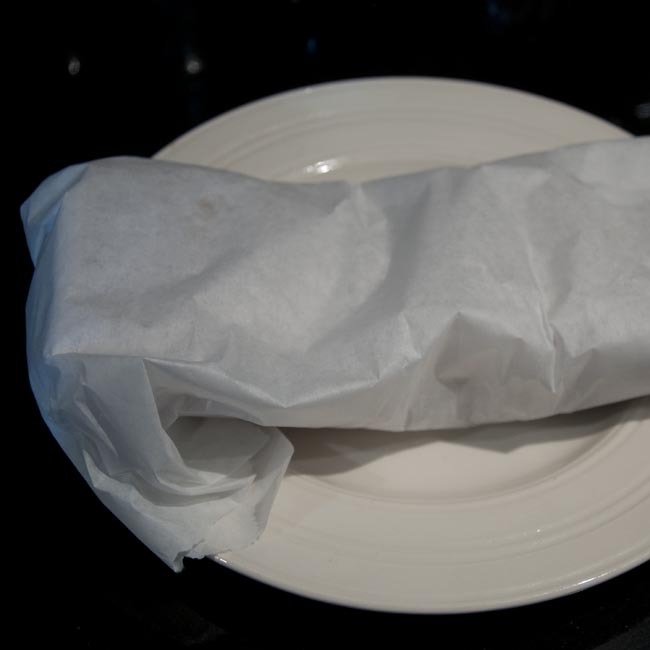 Big Bacon Challenge: Day Two – carry on as before! This is where it all starts to get a little bit repetitive. Today – just like yesterday – take the bacon out of the fridge, pour off the pickle, re-apply the dry cure (another quarter or fifth depending on whether you’ve got belly or loin) turning the bacon the other way up, and put it back into the fridge. There’s something special today, though – you should start to notice a change in the appearance and texture of your meat – already it’s less like pork and more like bacon, it may be visibly darker pink in colour than it was, and will certainly be starting to feel firmer, all of which is evidence that the cure is being absorbed, water is being removed, and the character of the meat is changing as a result – it’s the alchemy of curing, and it’s exciting to see each and every time. Big Bacon Challenge: Day One – getting into the swing of things! What you do with your bacon today is the template for the next few days, really. Get your container out of the fridge. 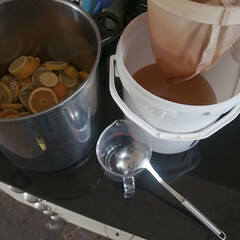 You’ll notice the liquid in the bottom – its probably a brown colour from the sugar in your cure. This is called the pickle and is completely normal – it’s made up of salt and sugar from the cure, and liquid being drawn out of the meat – but we want to get rid of it, or our dry cure will turn into a brine cure pretty quickly. So hold onto your bacon securely while you pour the pickle away. Don’t bother trying to dry the meat or the dish or anything like that, though. You might also notice, like mine, that the skin of your bacon has gone a bit blotchy. This is because of uneven distribution of the cure at this stage, and isn’t anything to worry about. Now look at the dry cure you have left over and roughly divide it into four parts (or five, if you’re making back bacon). Accuracy isn’t important here, just more-or-less. Now rub your quarter (or fifth) of cure all over the bacon like you did yesterday, leaving the bacon the other way up in the dish – so if it was skin-up yesterday, skin-down today. That’s it, about a minute’s work. Just replace your clingfilm and put the dish back in the fridge. Big Bacon Challenge: Day Zero – time to begin! So, now you’ve (hopefully!) received your pack of curing salt, have laid your hands on a promising looking piece of pork, and are raring to get going turning it into bacon. First of all you may need to do a bit of preparation with your pork. If it came as a tied ‘joint’, cut all the string and flatten it out. Rinse it under cold water before drying carefully with some paper towel if there’s any loose material on the surface left over from butchering, or if it seems ‘wet’ – this is more likely to be the case if it’s been vac-packed or previously frozen. 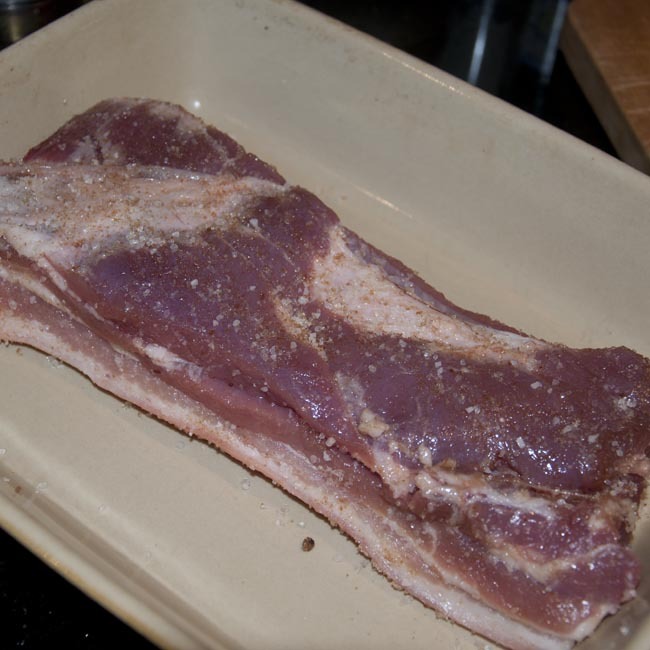 A loin piece should require no further preparation, though you might want to trim away any really loose bits of meat. If your belly piece has come from a butcher or farm shop there may still be ribs on the inside surface. Trim these away from the rest of the meat, preserving as much flesh as possible. You also want the non-skin side to be able to absorb the cure as well as possible, so if there’s a thin layer of fat on this surface, you want to remove it. It should peel away carefully, or use a sharp knife. 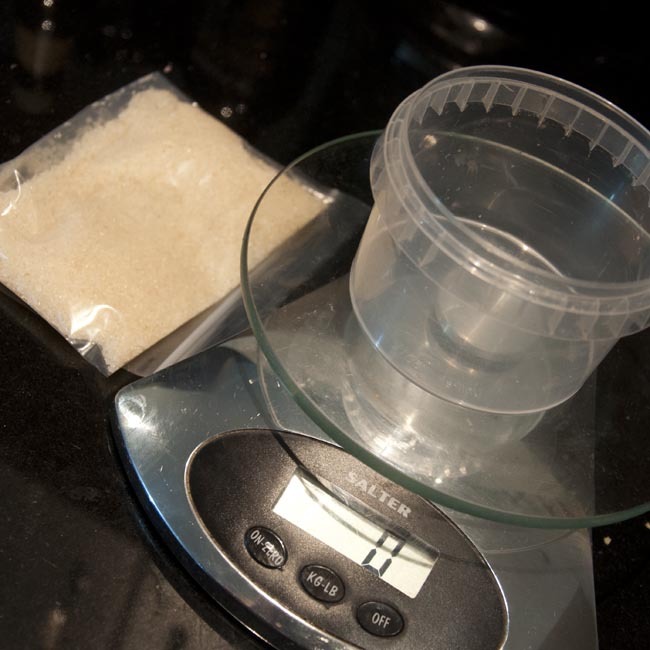 Now weigh your prepared meat and make a note of the weight in grams. Mine weighed very slightly under 600g. 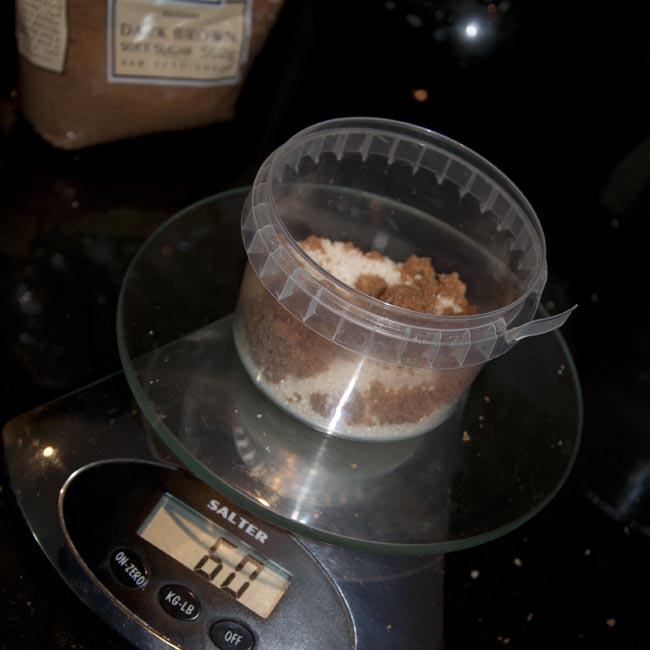 The total cure weight is going to be 10% of the weight of the meat – so for 600g I’m looking for a total weight of cure of 60g, which is going to be 80% curing salt and 20% sugar – so in my case 48g of salt and 12g of soft brown sugar. Mix these together thoroughly in your airtight container. You’re ready to take your first steps in the ancient culinary alchemy of curing! Take some of your dry cure and rub it all over all the surfaces of your meat. There’s no hard and fast rule about how much to use for this first application, but I tend to use about 1/3rd of the total cure mix. The cure will absorb least well through the skin, so while you should still rub some of the cure onto this surface, concentrate on getting the cure in to contact with the meat. 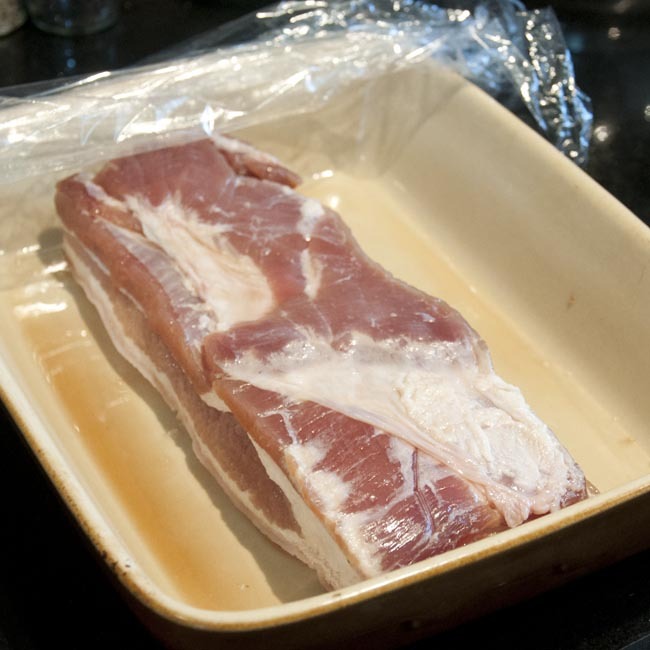 Now place your cured pork into your non-metallic dish, cover loosely with cling film, and put it in the fridge until tomorrow. If you peek later, don’t worry if you start to see liquid in the bottom of the dish – this is quite normal and shows something’s happening! Remember to seal the container with the rest of the cure in to keep the air and moisture out! Please do keep me posted on your progress! Big Bacon Challenge: Day Minus One – getting ahead! So, welcome all to the first post of the Big Bacon Challenge series – I’m so excited! I put the curing salts in the first class post today to those of you who have asked for them, so I hope they should arrive with you in the next day or two. In the mean time, there are a few things you can do do get ahead – and I’ve already had one request for starting instructions! If you haven’t already found it, start looking for a piece of pork to cure. 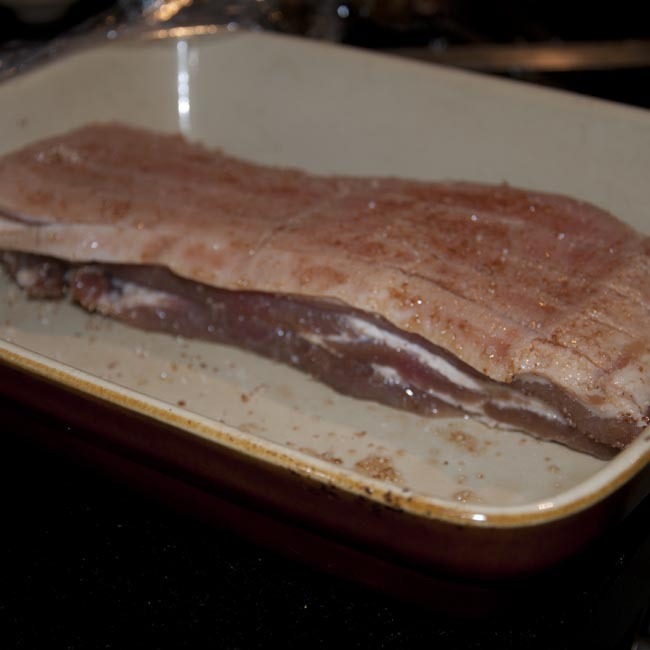 Pork belly will make streaky bacon in five days, and a piece of pork loin will make back bacon in six. I suggest looking for a piece about 500g in weight for your first attempt (and this will leave you enough left-over cure to make another piece afterwards, possibly with some different flavours in the mix!). You’re looking for a nice quality piece of pork, ideally with the skin still on. It’s not a problem if the skin has already been scored – as it often will be on a piece ‘intended’ for roasting – in fact I think it helps the cure penetrate more evenly. 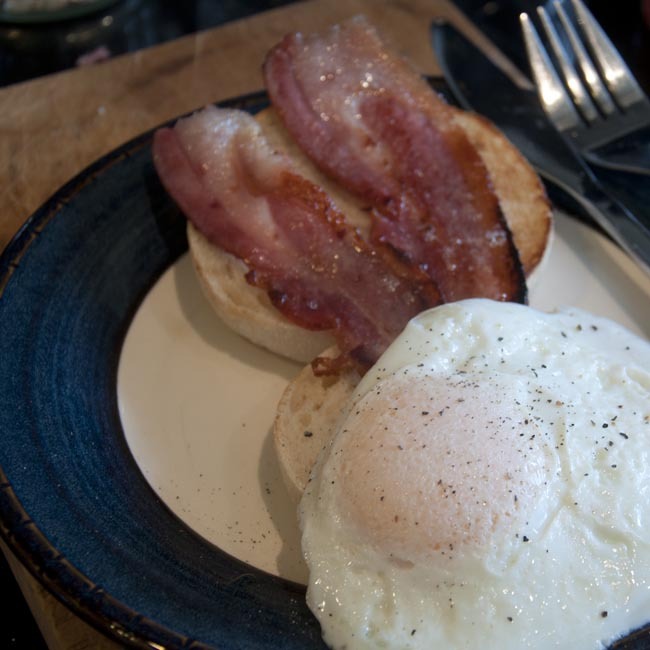 In a perfect world it would be gorgeous free-range pork from your local farm shop or butcher, but even a bargain piece of belly from the ‘value’ meats section of the supermarket will produce better bacon than you can imagine, so don’t fret too much – it’s just an experiment, after all! 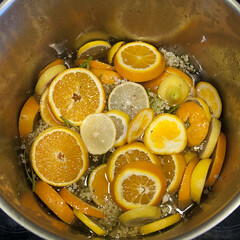 The important thing is that it should be nice and fresh, so buy it as close as possible to starting the curing process. A non-metallic dish for curing your bacon in. I generally use a stoneware or pyrex oven dish, as this can be covered without the cling film coming into contact with the meat so the air can circulate. Mind you, I’ve seen variations on dry curing that suggest packing all the cure and the meat in a plastic bag for a week, so I’m not sure the vessel makes all that much difference! Some nice dark sugar – between 20 and 40g depending on the weight of your pork, soft dark brown is ideal, or try muscovado or even molasses sugar for a really dark intense flavour hit. Something airtight to hold your made up cure – I use a small recycled plastic tub with a snap-on lid, but a ziplock bag would also be fine. If you’re getting so excited you just can’t wait, you can get going already following the older posts on making streaky bacon and back bacon. Or, if you can bear to wait until tomorrow, we’ll start the series of day-by-day instructions, in much more detail! I can’t wait to hear how all my volunteers are getting along, so please do comment as we go!